As much as Duncan Jones’s Warcraft film tries to be a faithful adaptation of the popular game series, fans surely noticed some massive, massive differences between the two. The paths of many popular characters changed, stories pivoted in unexpected ways, and cities literally shifted. To make sense of it all, we went to the director himself. 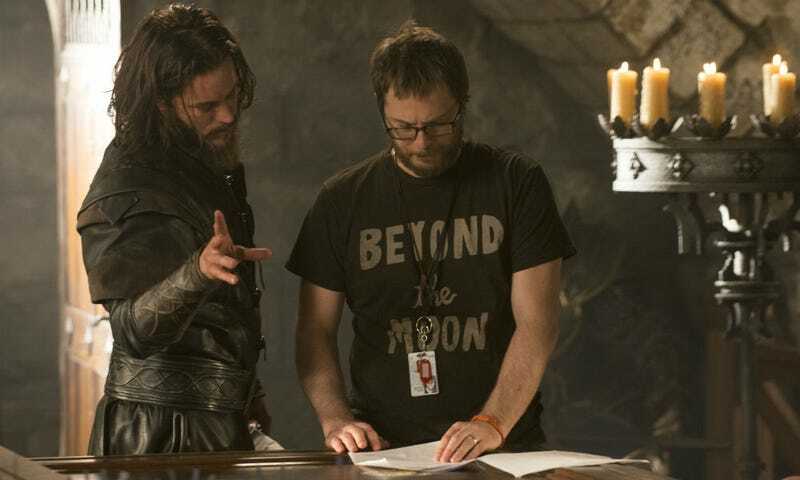 Fimmel and writer director Duncan Jones. Why make any changes at all? Secondly would be, as a film-maker, we’re trying to make a film, which is a very different medium than a game, especially when you have twenty years to tell your story. Can I find ways to streamline things that keeps the spirit and the DNA of the lore? But at the same time just makes it practical? Because, it’s not a game. And it’s not The Iliad. I can’t talk about who-begat-who-begat-who. Which you kind of have to if you’re going to start throwing extra depth and explanations of who caused that, and then having to explain who that person is and who caused that. You just kind of go down a rabbit hole. Dalaran is the home of magic in Azeroth; it’s run by a council of mages, and a city home to masters and apprentices researching and practising the art of magic. Eventually in the world of the games, those mages — a faction called the Kirin Tor, whose emblem you see burned into Khadgar’s arm in the movie — levitate the city out of the ground with their power to safeguard it from attack. But in Warcraft, Dalaran is already seen floating above in the sky. The reason? According to Jones, it just looks cooler that way. [We just thought] it would be cooler if Dalaran was floating then if it were on the ground. Back in my head I have retconned ideas if we get to make more films on how to get back on lore track. So, please understand: I am aware and I do have a solution. Why change the roles of Durotan and Garona? In the Warcraft games, the fates of Durotan and Garona are very different. Durotan is murdered alongside his wife Draka by Gul’dan’s guards to get the meddlesome orc out of the way. Garona’s story is much more tragic; mind-controlled by Gul’dan’s dark magic, she is forced to turn on her human allies and assassinate King Llane in front of his own son, an act that leaves the human kingdoms ripe for the taking (more on that in a bit). In the movie, those characters are given very different, but arguably more interesting, stories. Durotan battles Gul’dan one-on-one, and sacrifices himself so his people realise his true, evil nature. Garona still kills Llane, but it’s at his request because he knows that’s the only way she will be able to once again become a trusted member of the Horde, allowing her to secretly strive for peace. They’re huge changes, but Jones has his reasons. And for me, to engage an audience, both of fans but also people who are not fans, I need to make these characters that people are going to care about. If Durotan is going to go up against the Horde, if he’s going to go up against Gul’dan, why is he going to do that? Why is he going to put himself and his family and his wife and child in a position where they can be in danger? All of that has to be explained, and it has to come out of the mouths of characters who you believe would do these things. All is well in Stormwind. For now. Why not end the film with the fall of Stormwind? The game that Warcraft is based on, Orcs and Humans, ends on a much darker note than the film: the humans lose, and they lose badly. With Llane assassinated, the Orcs assault Stormwind City. Lothar evacuates the civilians as the Horde pillages the city and burns it to the ground. This action is the impetus for the humans coming together with their Elven and Dwarven allies to form the Alliance. I kinda feel like we’d bitten so much off with what we were trying to achieve. We had to introduce all of these characters, introduce all of this world to people who may not know anything about it. I think the fact that they got the portal closed was enough. You know, whatever happens next will happen next. But that kind of felt like a pretty good chunk size. In two hours, we can get that done. Anything more, you’re kind of running into a convolution of epilogues and of story. Ben Foster is Medivh in Warcraft. Why is Sargeras not in the film? The mysterious magical energy called the Fel is a huge part of Warcraft, both in the film and the games. In the latter, we know it means one thing: the demons of the Burning Legion, a vast, world-spanning army of demonic monsters led by one of the biggest villains in Warcraft lore, Sargeras. In the original Warcraft, Sargeras was the entity that had possessed the Guardian, Medivh, for his whole life, tricking him into working with Gul’dan. However, in the movie, Sargeras isn’t mentioned at all—but Jones doesn’t think that means he doesn’t exist. I think that there is a looseness of the Source of the Fel. We know that Gul’dan’s got it. We don’t know how he got it. We know that Medivh’s got it. We don’t know how he got it. I think there’s enough of a looseness there that the existence of Sargeras can still exist within this retconning. And how much detail we ever get into that? You know, Sargeras originally being a protector and being uncorrupted and then him trying to set the Orcs against Azeroth. Is that going to explain to me why Lothar is doing what he’s doing? It’s too much. But you know, it’s all still there and it’s all still possible. I would be thrilled if we get the chance to do a trilogy and maybe there’ll be a little bit more of that kind of background stuff? But I would rather say, “this is where we’re starting”. Maybe we’ll know a little bit more about the Fel, because I think that would be useful, but let’s move forward with the story we’ve got and start to deepen that out a bit. Why didn’t Khadgar rapidly age? 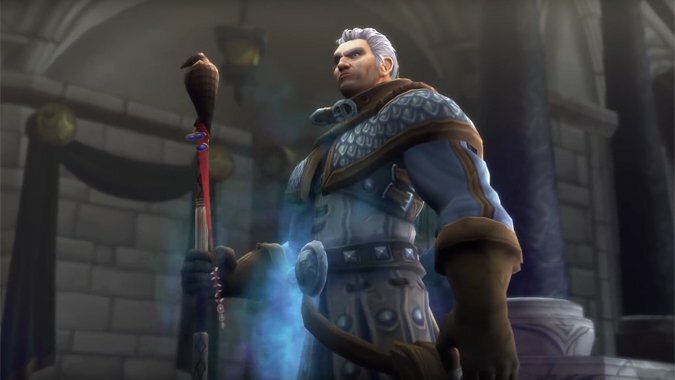 At the end of Warcraft: Orcs and Humans, Khadgar’s defeat of Medivh causes him to suddenly and rapidly age to an old man (which is how he appears in the World of Warcraft game). This doesn’t happen in the movie. As for why, Jones just referred back to his previous statement; if they get a chance to go more films, this could be in there. Did he always know Thrall would be the final image? The final image of the film — namely Durotan and Draka’s baby being spotted by humans — has huge importance for anyone already familiar with the Warcraft franchise. That baby is Thrall, who eventually becomes one of the most prominent characters in the world of Warcraft, and the final shot of him was one of Jones’s earliest ideas. If we do have the chance to do more movies... to me, this story is about the Orcs losing their home. And Durotan trying to find a new one for his people. I would love, by the end of the trilogy, for us to know where the new Orc home is. And Thrall is obviously going to be massively important in that story. Khadgar and Lothar share a moment. Who the hell was Glenn Close playing? The heroes end up visiting a mysterious figure kept at the heart of Dalaran in the film, played by Glenn Close, who reveals Medivh’s betrayal and offers portents of doom should they fail to stop him. Even to diehard fans of Warcraft, her character is almost a complete mystery — but she is, according to Jones, playing a character named Alodi. Glenn Close is... well, we use the name Alodi, which is a guardian...kind of the original guardian. She is a guardian that comes from so far back that the Kirin Tor themselves don’t remember her in their understanding of war. So that kind of works for us and I think it builds from enough elements of the lore that, again, it’s one of those things where there may be pieces missing, but the pieces that are there are not wrong. What other Warcraft story is Jones hoping to tell? Jones is excited that he got to set the table for a larger Warcraft universe and though he wants to come back for a sequel if it happens, he also would love to see another aspect of that world explored. Specifically, he wants to see the events of Warcraft III, featuring the rise and fall of a human paladin named Arthas into one of Warcraft’s most iconic villains, the Lich King. I would love to see Lich King. You know, I would love to see these other things. I would love to see someone else tell those stories so that I could watch them as a fan. Durotan and Ogrim go to war in Warcraft. What’s the status of the sequel? Chris Benson and I have discussed in very loose terms what the trilogy will be. We all want to relax after this film. It took three-and-a-half years. And we’ll kind of get back into it if people like this film enough to warrant us having the chance to make a few more. The interesting thing is going to be the emphasis we spend on specific characters that may not be the same emphasis that’s in the game. But again, that kind of gives us a little bit more flexibility and freedom to see things from perspective that follows the same lore, but sees it from a very different perspective than you saw it in the game.